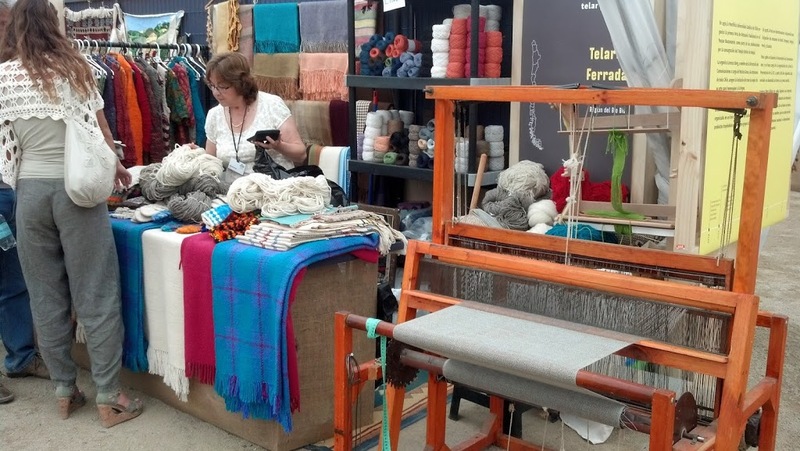 Wool, clay, wood, metal, stone, and horse hair, all materials that are readily available in Chile, and hence they are the basis for most of traditional Chilean artisan products. 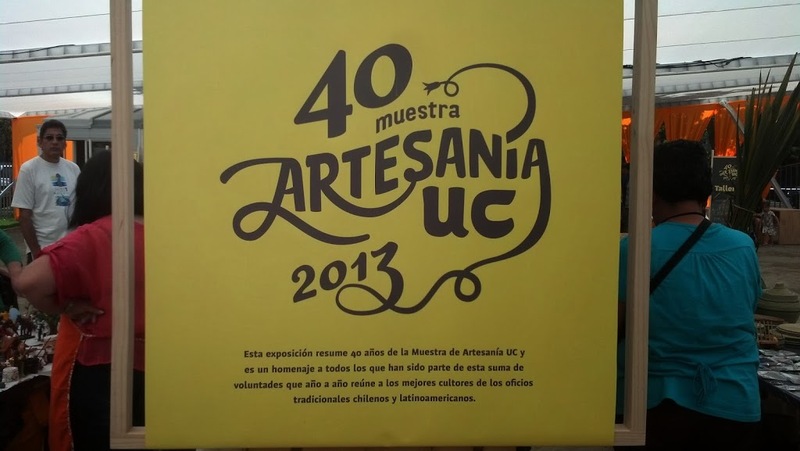 Late last year, while the presidential campaign was absorbing most of the airtime in Santiago’s public media, a world class group of artisans, sponsored by the Universidad Católica, exhibited their best products in Bustamante Park near Plaza Italia in the center of Santiago, Chile. 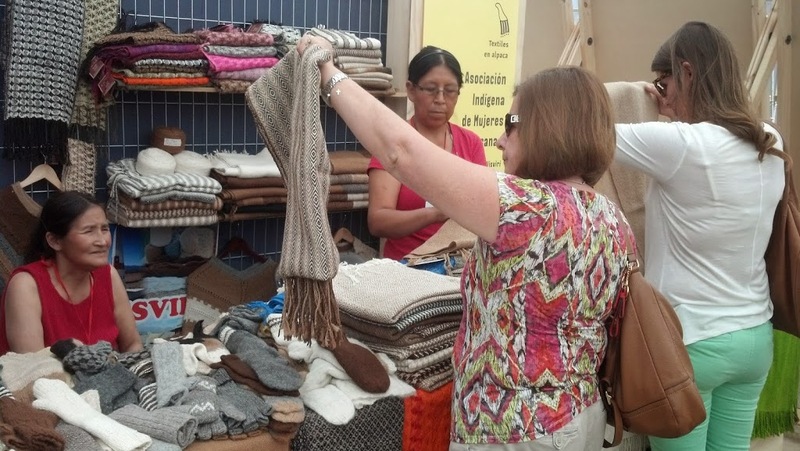 Most exhibitors in this two-week event were Chilean, but there were also artisans from Bolivia, Peru, Ecuador, and Mexico. I had seen the advertisements for this show, so I stopped by to take a look one day as I was walking back home from a meeting in the center of town. 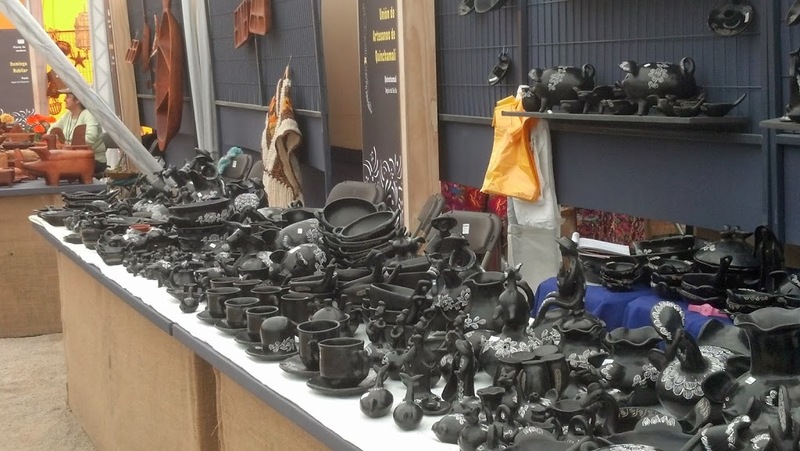 I have grown somewhat skeptical of artisan shows, because I find that plastic and other foreign materials “made in china” are taking over the “artisan” world, plus, we really don’t need any more “stuff”; we have plenty stored away that we don’t even look at now. But as soon as I entered the spacious exhibition, a deep, comforting feeling of déjà vu set in; I was taken back 45 years to my first travels through Chile as a Peace Corps Volunteer. The scene that greeted me reminded of the weekend trips I made in the late ‘60s with my friends Chuck, Neal, and Jane: by bus to buy hand knitted sweaters in La Ligua, a small dusty town north of Santiago, to Pomaire, out the road west of Santiago to buy pottery, and longer trips to the colorful Chillan and Temuco markets to buy other types of pottery and Mapuche rugs and ponchos, to Valdivia to buy miniature wood carved ox carts from a guy named Rivas, and to Pucón to buy wooden platters, bowls, and boxes. These memories resurfaced because the exhibit I was seeing bore testimony to the fact that over the years, these classic artisan products have prevailed over wave after wave of mass produced alternative “handicraft” products, and in fact today are being produced of extremely high quality at very reasonable prices; reasonable, but not dirt cheap like before, suggesting that maybe an artisan in Chile can now make a living with her work. So what were the best offers in this exhibit? To begin with, the woven products were exceptional. 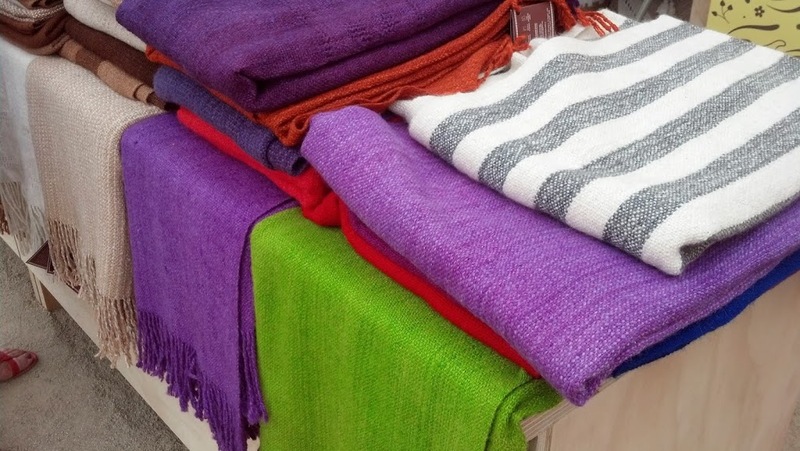 The Mapuche, indigenous inhabitants of the Araucanía Region of central-south Chile, have for decades produced colorful blankets, rugs, and ponchos. 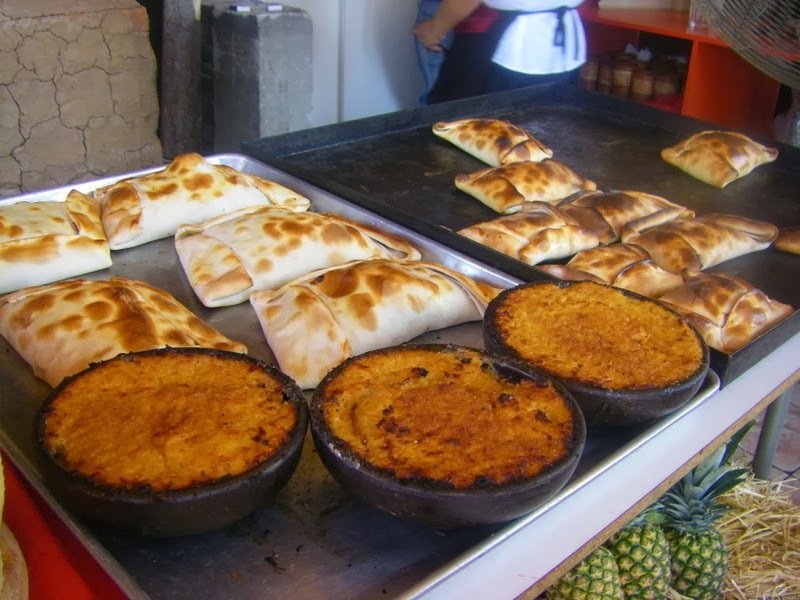 For visitors to Chile, these goods are often the artisan product most sought after, and a trip to the central market in Temuco was a must. 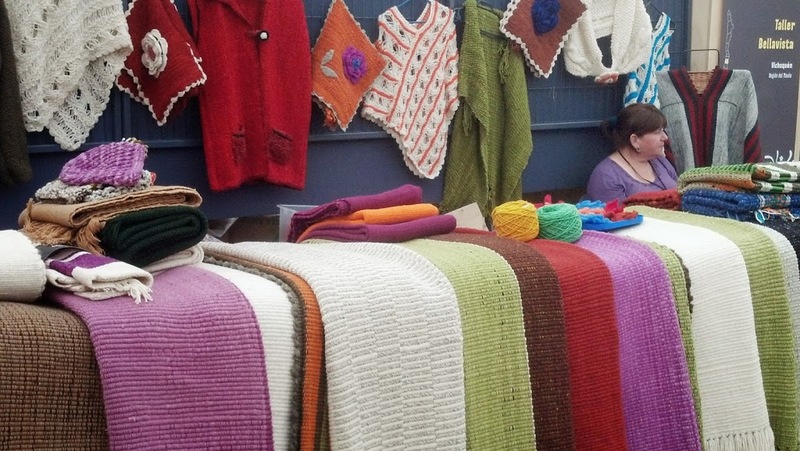 Other colorful weavings, now mostly wool, but also some alpaca (the relative of the llama and the Vicuña), have long been made in villages in Chiloé Province, on both the Grand Island of Chiloé (Ancúd, for example) and the mainland (Chaicas for one) through which the new Carretera Austral passes on its way to Chilean Patagonia. Maria Iris villarroel, a weaver from Chaicas, revealed to me how they get the vivid colors of green, grey, orange, and yellow in their blankets: for the green, they soak the wool in water with heartwood from the canelo tree; for grey, they soak the stems of the nalca plant with the wool; the orange color is produced by the juice left after making chicha (cider made from grapes); and the yellow from onion skin soaked in water with the wool. 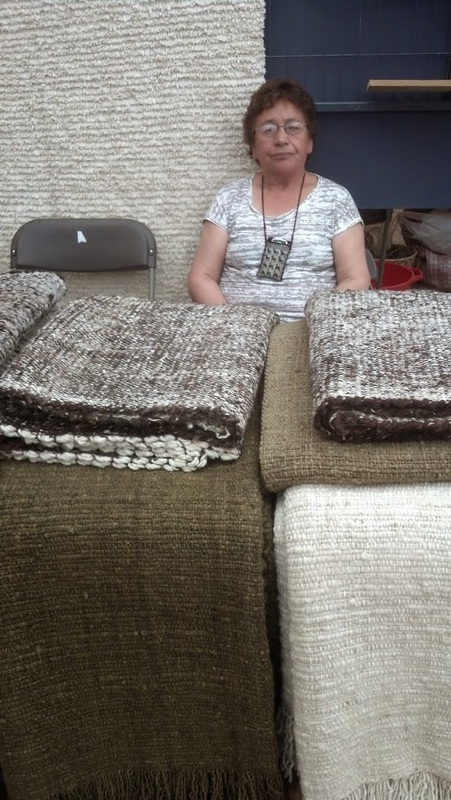 A very different style of weavings is produced by the Aymará in the far north desert region, in places like Colchane in the Tarapacá Region. 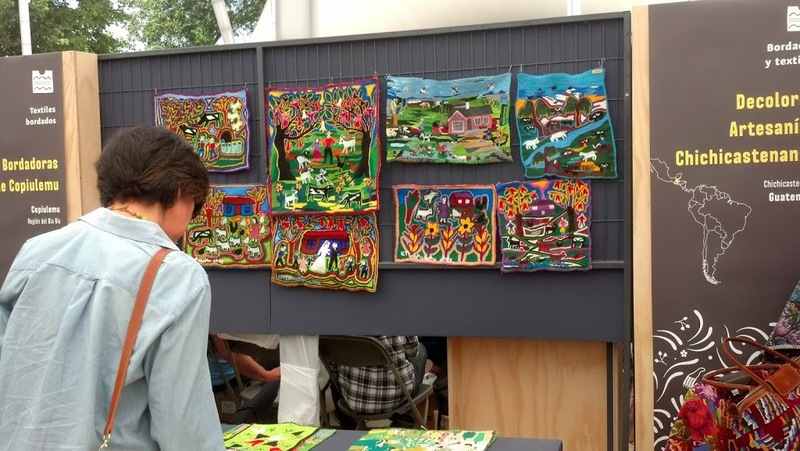 They aren’t exactly woven, but Chilean artisans have produced embroidered art, one of the most well-known being the embroidered wall hangings, about the size of a small window, that depict in the naïve mode, stories or real life scenes, produced in Isla Negra (one of Pablo Neruda’s home towns on the Central Chilean coast). While these Isla Negra embroiderers were producing their works to earn a living during the hard times of the dictatorship, they often inserted more or less blatant political messages in the designs protesting the state of affairs at that time. 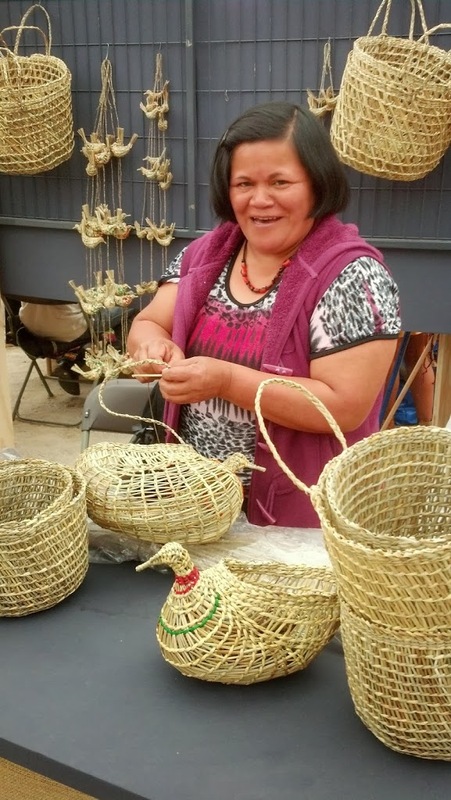 The art is prospering in Chile still because of groups of women such as those in Ninhue and Copiulemu in the Bío Bío region. 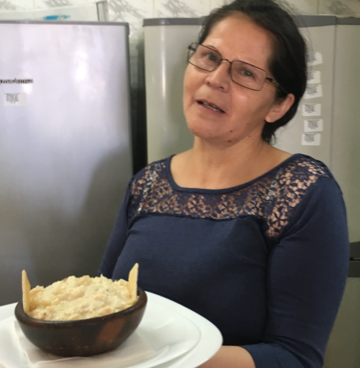 A trip to Pomaire was, and still is, a common one-day excursion for residents of Santiago, but mostly for tourists, both Chilean and foreign. 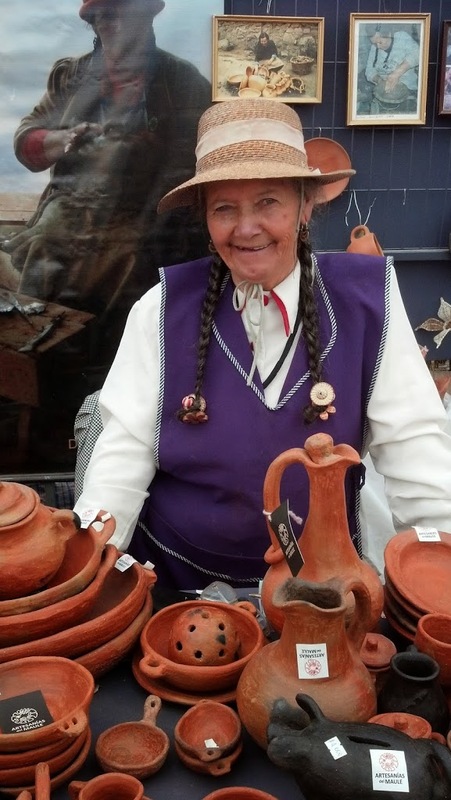 I remember Pomaire in the late 1960’s as a very quaint, lovely, hospitable but sleepy town, with dusty dirt streets (muddy in the winter) lined with small shops were potters worked in the back and sold their goods in the front. 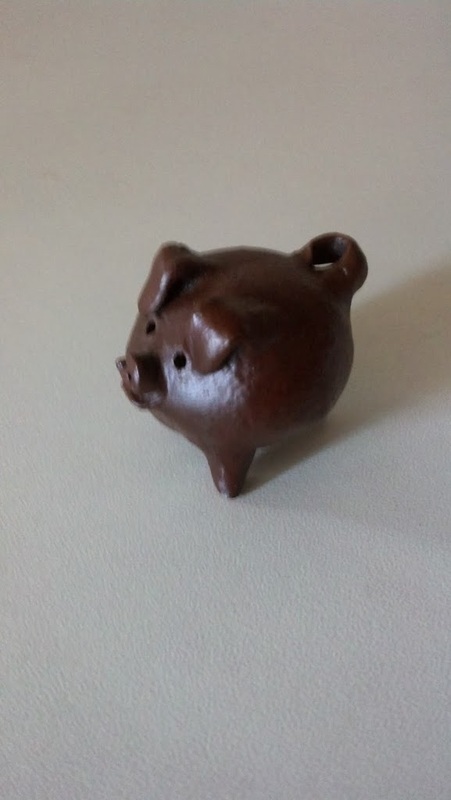 This is the home of the famous three-legged pig, made from dark brown clay. 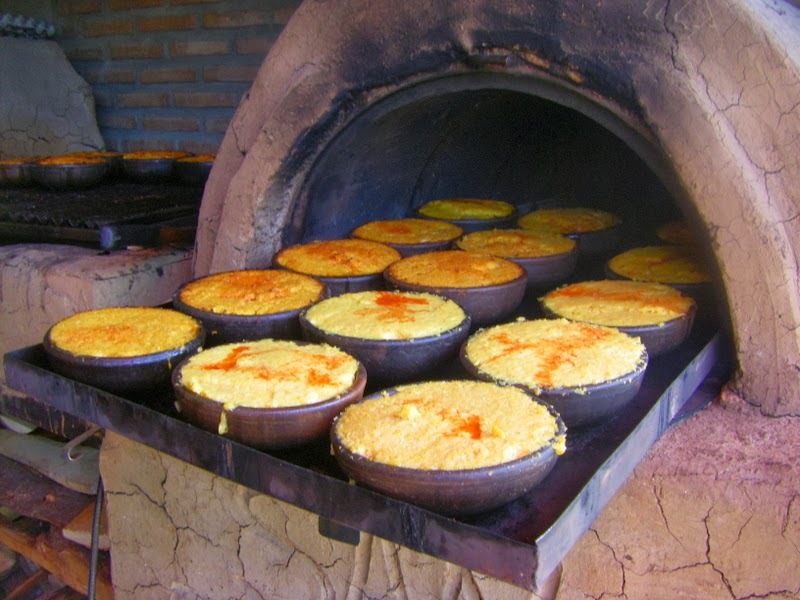 Popular then, were the plates, cups, mugs, and individual pailas, small bowls used to bake pastel de choclo, pastel de papas, and chupe de locos. These very practical and inexpensive items are still made today and were in the exhibition. 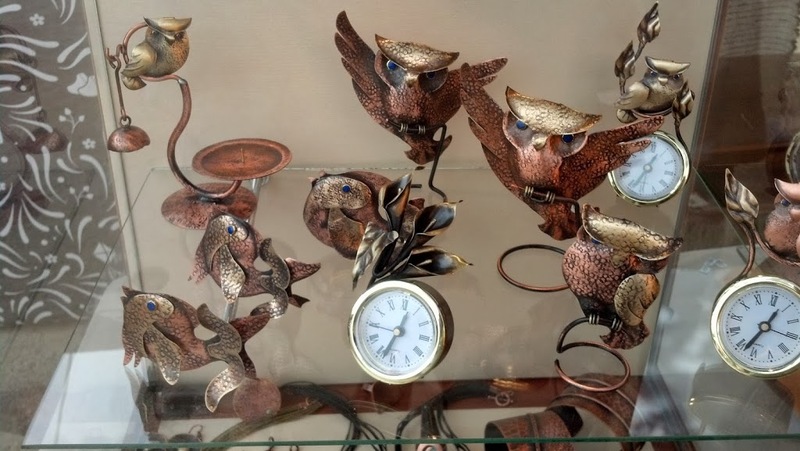 Today they are just as popular, but Pomaire has suffered the fate of so many previously popular artisan centers overrun by tourists and invaded by cheap, trashy souvenirs that have nothing to do with the place itself. 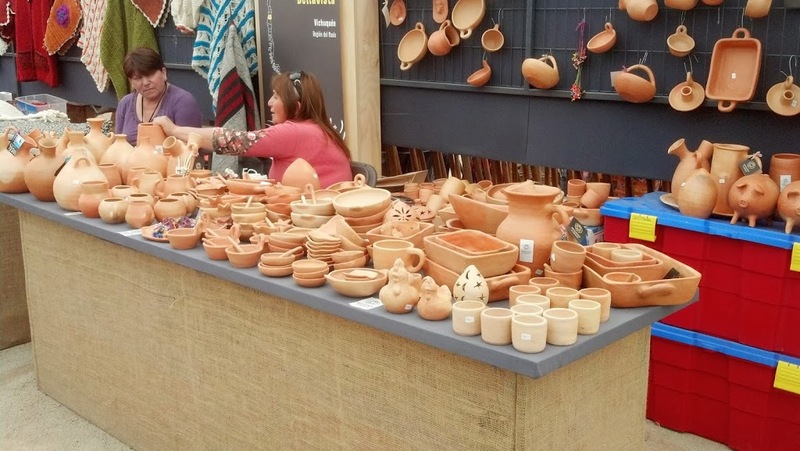 Besides pottery from Pomaire, there are now very attractive ceramic offerings now from Vichuquén in the Maule region of Central Chile, and Gorbea and Padre las Casas in the south. 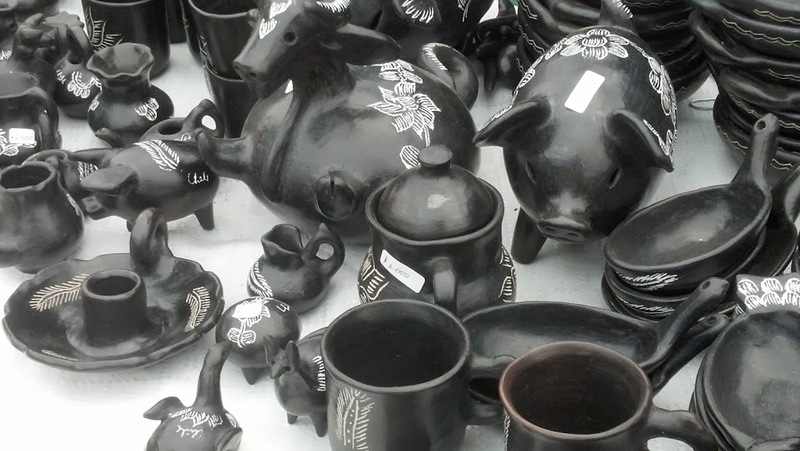 Of course the traditional black with white Quinchamalípottery is still being made in that town near Chillan, and is still very popular. 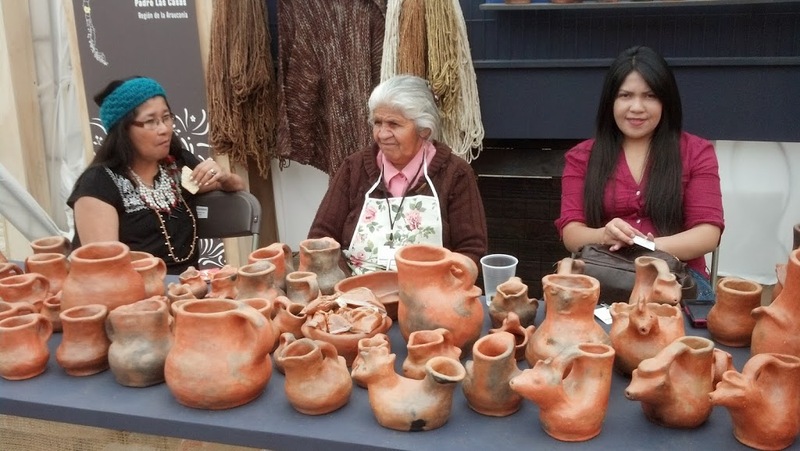 Diaguita designs from that earlier civilization, adorn pottery made in the 4th region of Chile, in what is called the Norte Chico, or small north. 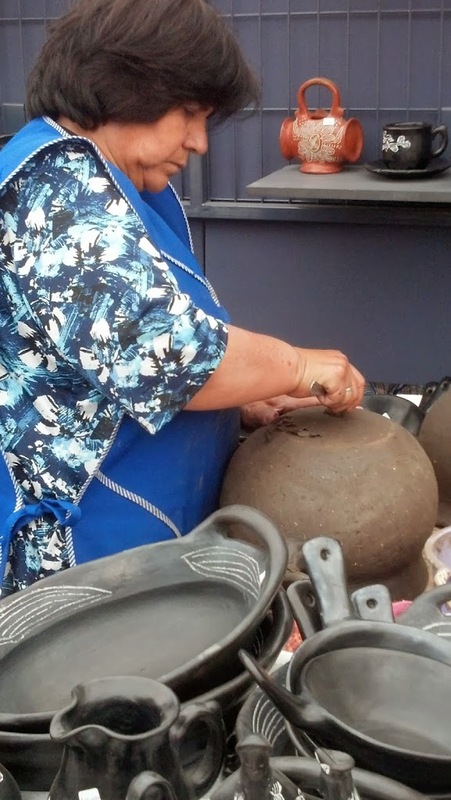 A most interesting potter in the exhibit was Delfina Alguilera, an aged producer of very rustic style of pots. 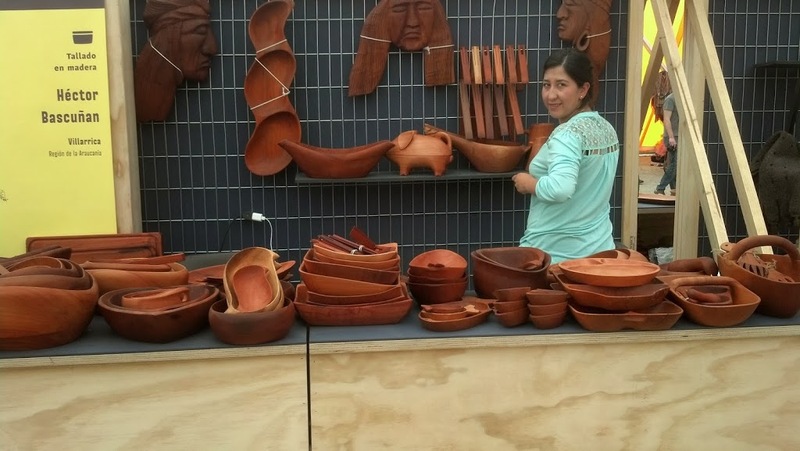 She lives outside of Cauquenes, a mostly agriculture town in a very rural and quite poor area, where due to the rich clay soil in the area, large brick making operations produce building materials that match, in color, Delfina’s pottery. She told me she wouldn’t miss participating in the exhibit since it is her only “outing” each year. The ox cart carvings we bought in Valdivia in the late 1960s from Rivas, a fantastic carver rendered quite unreliable by his love of the grape, were carved from raulíwood, a beautiful tree common to the mixed hardwood Valdivian forest in the Lakes district of southern Chile. This same wood is the main raw material for most of the sleek bowls exhibited from Villarrica. 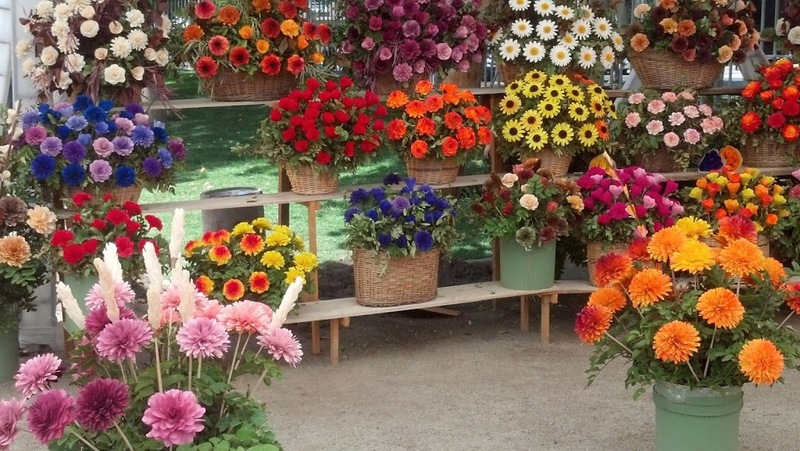 The unique but widely appreciated wooden flowers sold in Pucón, are not necessarily made from raulíwood. 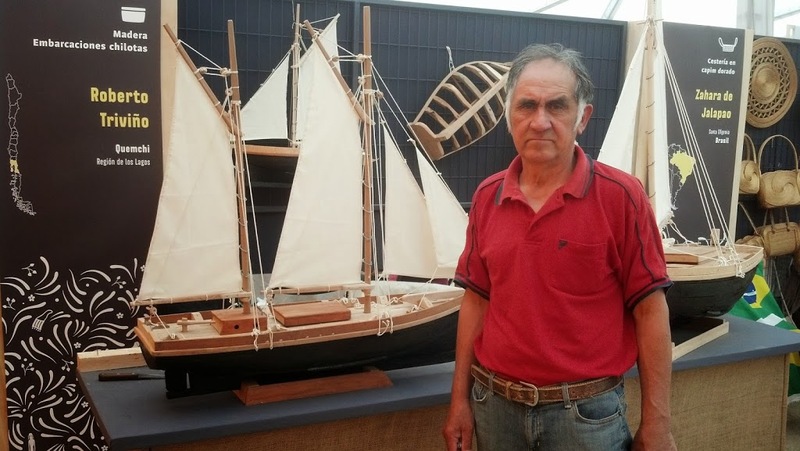 Instead of ox cart carvings, the exhibit featured the wood working craft of miniature tall ship building. And of course you can still buy cute items made from crin, or horse tail hair. Some are actually useful, like the Christmas tree ornaments, coasters for glasses, and book marks, and they are great gifts to take to distant friends and family because they weigh almost nothing and take up no space. 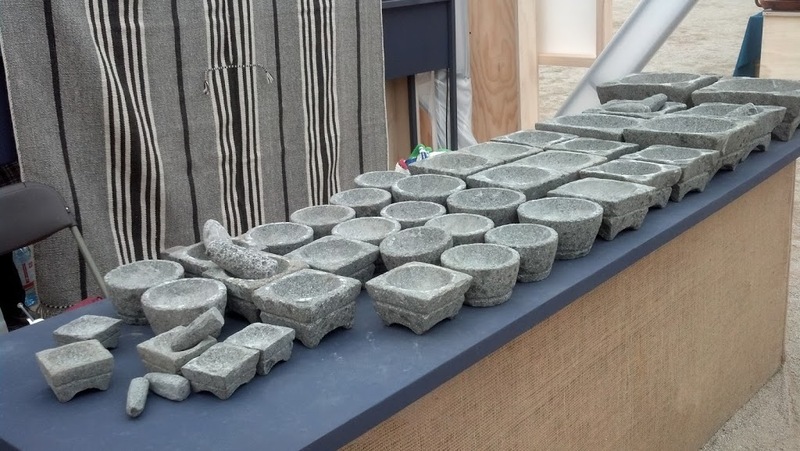 Stone mortar and pestle sets, modeled after the ones used by early inhabitants to mash grain, garlic, dried hot peppers, and anything else that required grinding into powder, make a great gift, if you don’t have to transport it very far, since it is bulky and heavy, of course. 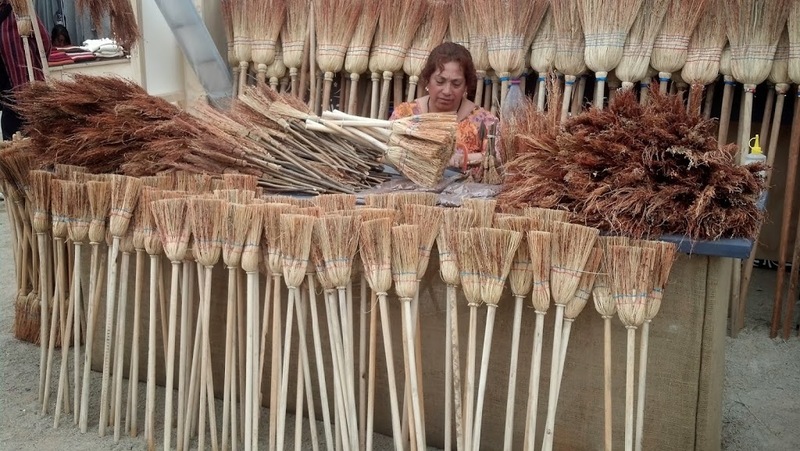 If you have travelled south of Santiago on the Pan-American Highway, you most certainly have noticed the handmade brooms sold along the road near Rengo, and the two kilometers of stores selling mimbre (woven strips of willow wood) furniture in Chimborongo. 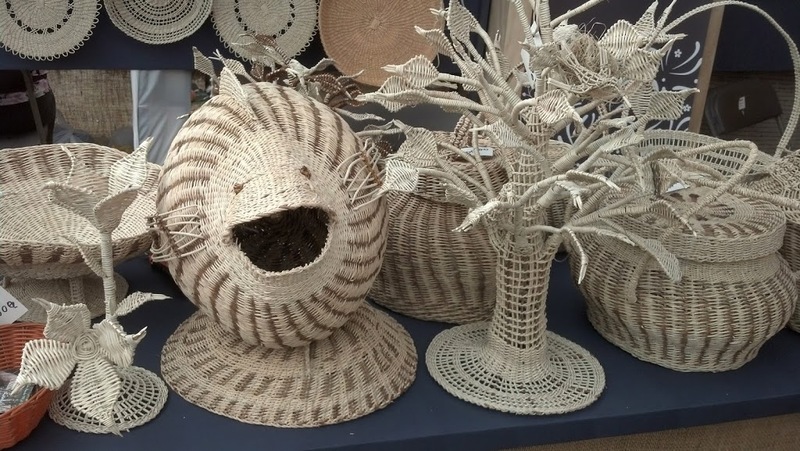 And baskets, baskets, and more baskets. Copper jewelry, trinkets, and costly artifacts get more and more interesting as time goes on. 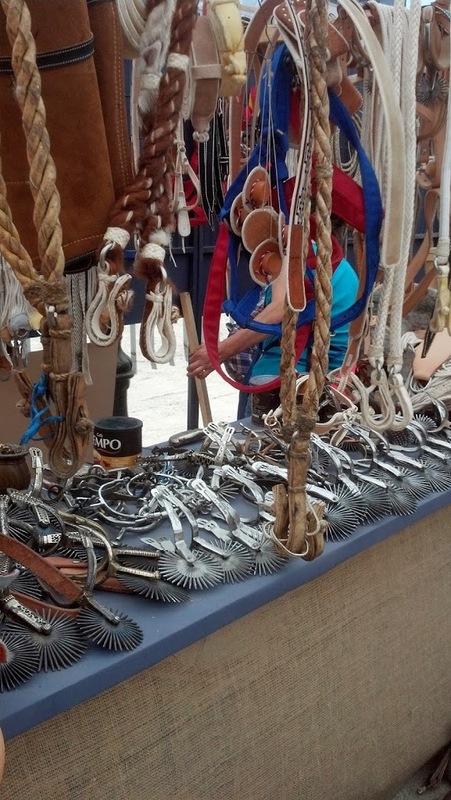 The leather and metalwork that goes into all the equipment a Chilean horseman needs for himself and his horse are still available, but indeed scarcer as rural Chile and the domain of the huaso give way to urban habits…and Audis. 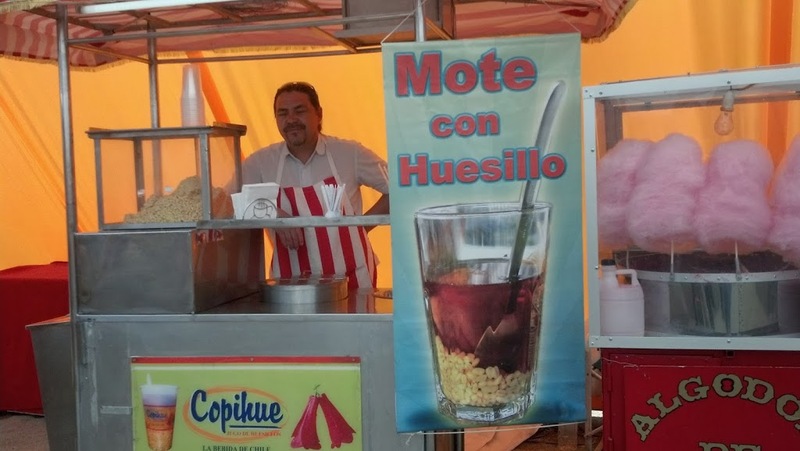 Ah yes, I almost forgot to mention, in the context of traditional Chilean artisan products, the old favorites of the empanada, the pisco sour, the longanizafrom Chillán (hopefully from los Pincheira; the sausage-making Pincheiras, not the outlaws), and a big glass of cool mote con huesillo. The fine folks that make these on a daily basis are also true artisans in my book. 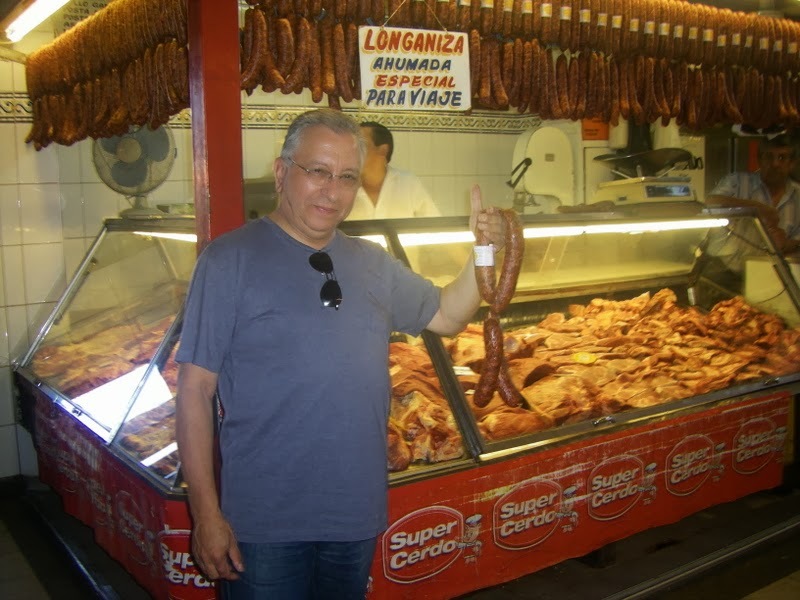 Dave, thanks for sharing the sights and tastes that you experiences at the Chilean artisan’s exhibition. Your descriptions of the crafts and food really do bring back memories from many years ago. Very interesting article. I have some lovely things from my two short stays in Chile. 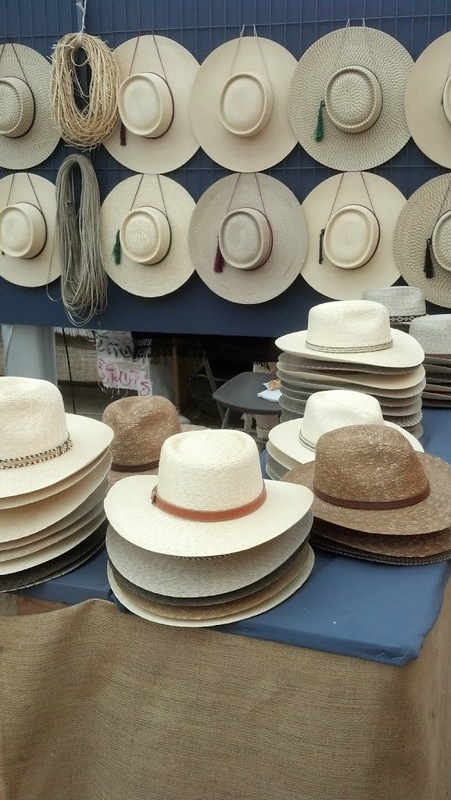 Como seguramente sabes, soy fanático de las artesanías y las compro en cualquier lugar que visite . 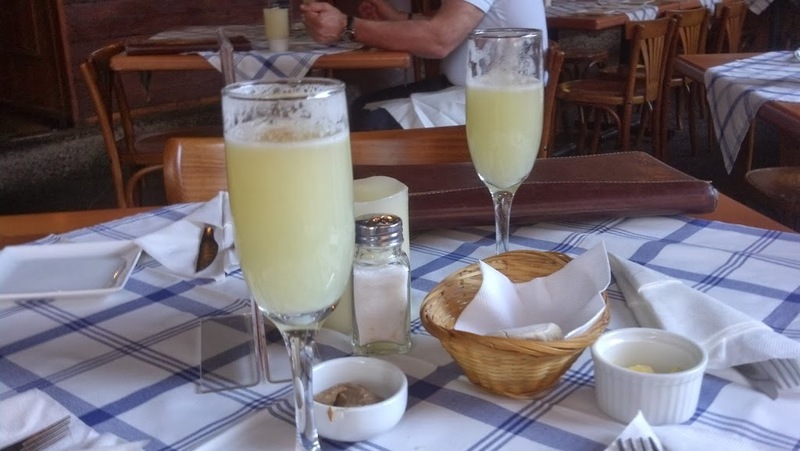 Como olvidar Guatemala, Mexico, Bolivia? 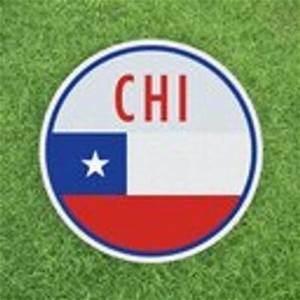 Para que decir Chile. Por cuatro años fui el Director fundador del Museo Arqueológico de Azapa de la U Católica del Norte , y allí fui el “ guardian “ de la protección de las “ artesanías “ precolombinas cuando nadie daba atención , salvo los que saqueaban y vendían en Chile y en el extranjero . 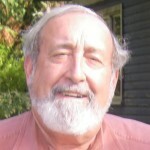 En ese tiempo fui a Bolivia con John Coltman voluntario del Cuerpo de Paz que trabajaba en la Escuela de Negocios de la Universidad . 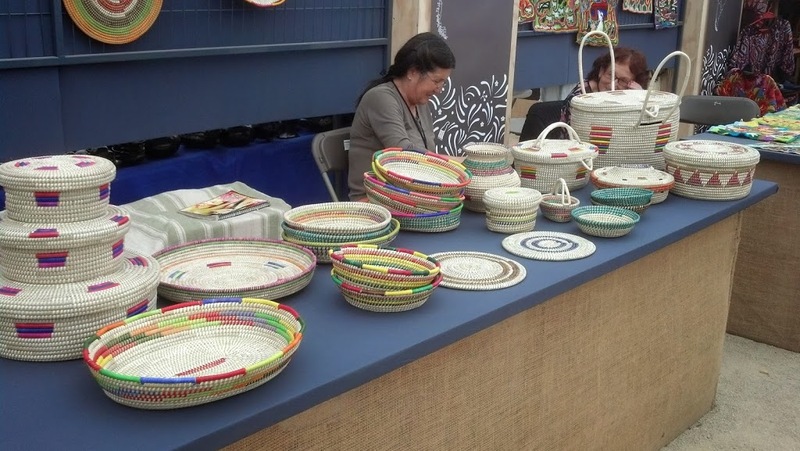 Fue la primera vez que me encuentro con tanta riqueza artesanal y toda de raíces pre colombinas y de ahí en adelante fui un amante de ellas. I really enjoyed the artisan review. I still display my Quinchamali pottery with pride. 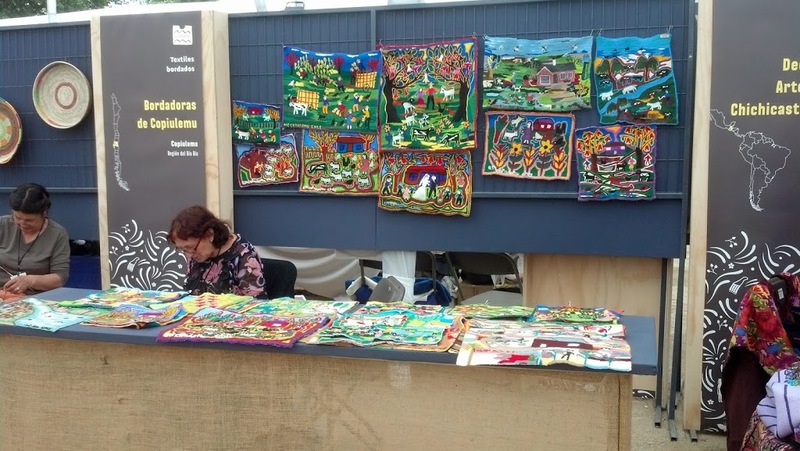 Las mejores longanizas de Chillán ya no son las de Pincheira, sino las de “Artesanos de Chillán. We enjoyed this entry and yes we remember much of what described. 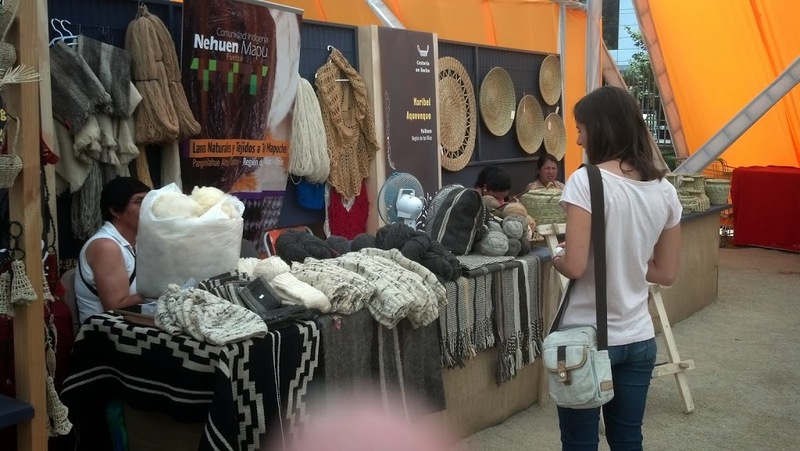 In particular the Chillan market, pottery from Quinchamalí, and a rug we bought from a Mapuche women in Pucón. I’m a photo researcher working on an educational publication and we would like to seek permission to use one of your photos. Can you please email me at evamsvec@gmail.com to let me know where I can email a detailed permission request to?